August is gone and it is time to review my investing and trading effort again. This month was bad as far as results go. First in my trading account I was getting rid of bad trades from the beginning of the year I no longer wanted. I had a question from one investor why I was getting rid of those stocks when I was so enthusiastic about them in the first place. The reason wasn’t that I no longer liked them (for example LGCY), but they no longer fit into my new trading strategy. I still continue investing into these stocks in my ROTH IRA account and in my Scottrade account where I use FRIP program and currently reinvest all my dividends into LGCY. In my Motif account I still invest into Conoco Phillips (COP) and plan on adding more shares. I still expect the energy stocks perform excellent when all this mess ends. That’s why I rebalanced my 401k just today and trimmed gains from REITs, S&P 500 (yes, I was surprised too that the SPX fund was showing a significant profit even after the market slump) and moved it into Energy sector and precious metals funds. Investing Series: What is Investing, exactly? By Save. Spend. Splurge. This month was definitely interesting and scary at the same time. But it also offered a great opportunity to invest more money contrary to what others said about the market during the selloff. If you are a long term investor, this is a great opportunity. And don’t be worry seeing your portfolio down a lot. It is OK when everybody is selling and panicking that your account will be down. But as a dividend investor, it doesn’t matter. If you hold good quality stocks, they still pay you dividends every month, or quarter and if you are reinvesting dividends (dripping) you are buying cheaper and cheaper every day the market drops more. And that’s what I love! And if you are a trader, yes, it may be a bit frustrating if you get caught on the wrong side of the market, but if you have a plan and strategy, you do not have to worry either. August brought bad results a few-fold. Once when I got rid of the bad trades, second, when I got caught in bad trades which turned against me quickly, and third, by increased volatility which sent even good trades into a red territory. There was a significant lesson to be learned in my trading account. I had a great strategy which worked so well that when SPX started falling I refused to believe that the drop would go so far that my trades would be in danger. I was in such disbelief that I didn’t act and didn’t close suddenly endangered trades. Now I am stuck in trades which I am forced to take loss and manage them carefully to minimize that loss. Originally, all those trades were profitable and showing more than 70% profit before the market collapsed. You probably already see the pattern here and what my lesson was. Yes, I waited too long (until expiration) and let those trades turn into losers. And yet I refused to act and close those losers before they turned into even bigger losers. To avoid this mistake I decided to apply a 50% credit capturing strategy. What is a 50% credit capturing strategy? 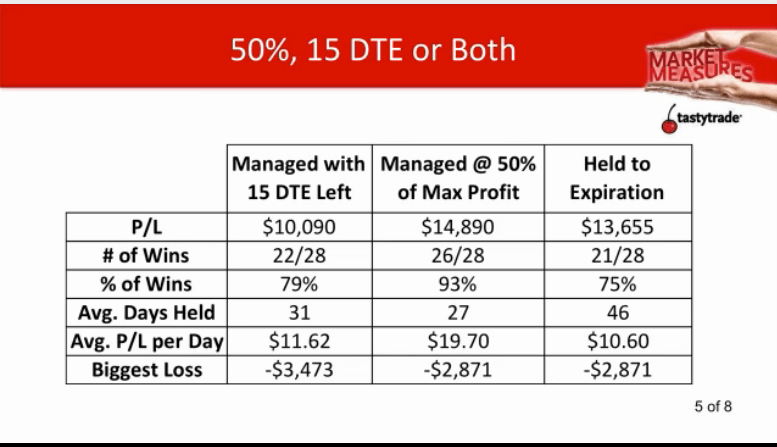 Per Tom Sosnoff and his Tasty Trade study it is actually more profitable to take 50% of your gain off the table and move on. For example, if I originally open a trade and collect $180 credit, I will be better off closing that trade at 50% of that credit (pay $90 to close the trade) and move on. Yes the total credit received will only be $90 instead of $180, but the probability of profit is larger. Why is it? The main reason is that this typically occurs around 15 days to expiration. After that the gamma risk starts increasing and the trade may turn against you. So not only I will block my money for only around 15 days instead of 45 days, I will be able to trade more often. At first I refused to use this strategy as I was looking at credit size but later I realized that if I will really be able to close a trade every 15 days, I will be able to make 3 trades instead of one in my 45 day cycle. If each will be $90 credit, I will actually make more money than with only one trade. 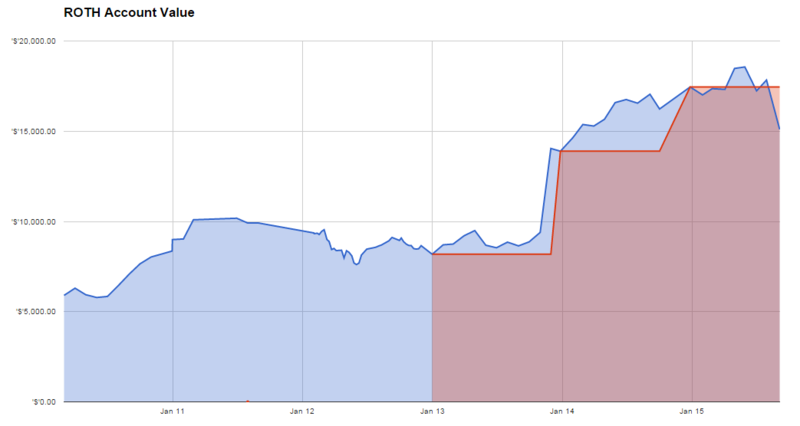 My August trading results were not as I would like them to be. Partially due to closing old trades with a loss, partially due to volatility, and partially due to a few of my trades being now ITM and showing a loss. But I am positive and understand that a drawdown is a part of the trading business and that I will be able to move over it and have more profits than losses. Although the results are not anything great this month, I believe I will be able to manage this account into a positive territory later this year. I also write about my new SPX trading strategy selling spreads for a premium, mostly Iron Condors. Many times I mentioned that the strategy worked well so far and makes me money. You may ask, why is then your account down almost 50% if your trading strategy is making you money? The reason is a consolidation of my account I decided to take. I decided to close losing trades instead of rolling them and dragging them behind me like a steel ball on a chain. I also didn’t have enough money to drag those trades further and I wasn’t willing to commit the rest of my money for that. So in July but mostly in August I closed those trades. However, here is my trading journal to show how the new strategy performs. I still hold a trade against AGU, but I decided to deal with this trade later and either close it or move it. Besides that trade I now only trade options against SPX. Since I decided to trade my new options strategy to trade it in my ROTH IRA account too, this now has impact on the account volatility. The cash value is now swinging up and down more than when I only held stocks. However, my primary goal is dividend investing in my ROTH IRA account. 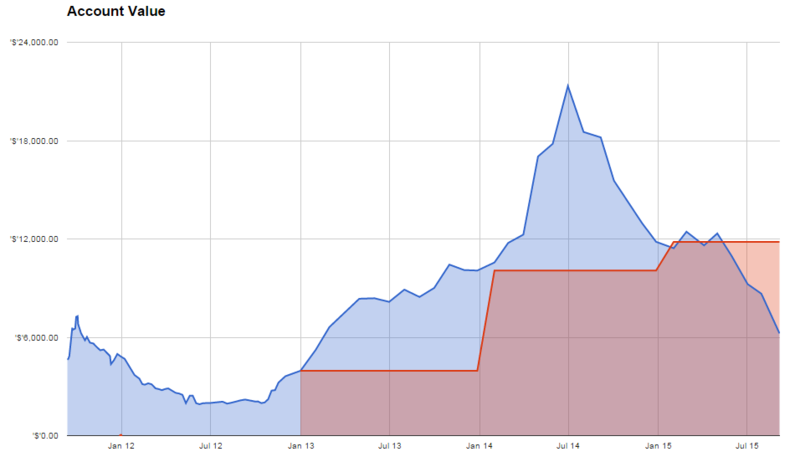 This month, I only traded options against SPX and I had no new stock addition or removal from my portfolio. The portfolio is down because of some oil exposed companies I added in the previous months. I still will be accumulating oil and energy companies to my portfolio if my money management rules allow it and as long as those companies will be depressed. My accounts dropped from previous month and are losing -6.25% for the year. Considering how bad the market was this month I think, this is not a bad result. I believe, that this is just a temporary drop which in 6 months nobody will remember. As always, I appreciate the DivHut mention. Nice looking dividend results too by the way. Pretty close to your goal of $1200 for the year in income. Keep on investing! Happy to include your post as always, good reading. Thanks for the review and stopping by. The dividends do not grow as fast as I wish, so I rely on options income to be reinvested.